This project offers a novel approach to the problem of automatic recognition, and eventually translation, of American Sign Language (ASL). We propose to take advantage of the fact that signs are composed of four components (handshape, location, orientation, and movement), in much the same way that words are composed of consonants and vowels. 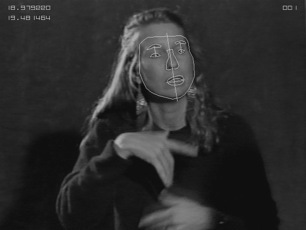 Instead of attempting sign recognition as a process whereby a match must be made between the analyzed input and a member of a stored set of lexical signs, we will treat sign recognition as the end result of several separate but interrelated component recognition procedures, of which the current project period concentrates on handshape identification. To accomplish our goals, several areas of basic research are uniquely integrated by our project team: linguistic research on the structure of signs in ASL, psycholinguistic research on human perception of ASL, and advanced techniques from statistical pattern recognition and computer vision. This integration represents an advancement over previous approaches to handshape recognition or movement tracking. 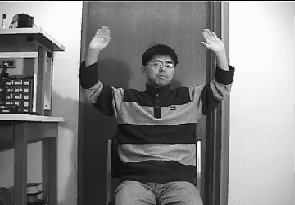 Here, we show some preliminary results for the movement tracking and handshape recognition. Extracting moving objects from their background or partitioning them have been one of the most prerequisite tasks for various computer vision applications such as gesture recognition, surveillance, tracking, human machine interface, etc. Though many previous approaches have been working in a certain level, still they are not robust under various unexpected situation such as large illumination changes. To solve this problem, we have worked with a motion segmentation based on the robust optical flow estimation technique under varying illumination. Following figures show the superior results of our motion segmentation method under varying illumination (click images to play movie clips). To reconstruct handshape from a stereo pair of handshape images, we calculate the disparity of image pixels first. 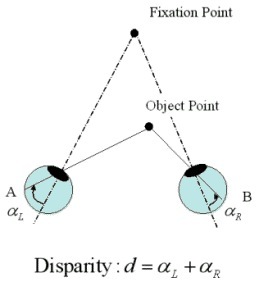 The disparity represents the depth information between the object and two cameras as defined in figure 3. We calculate the disparities of image pixels in the stereo pair of images based on the Marr-Grimson-Poggio (MPG) algorithm. This algorithm employs a hierarchical approach using different level of edge images obtained by the Laplacian of a Gaussian (Log) operation and zero-crossing with different parameters. At the higher level of edge images, coarse but more reliable edges are obtained. The disparity of pixels calculated on the higher level of edge images is used at the lower level of edge images to get finer disparity of pixels. 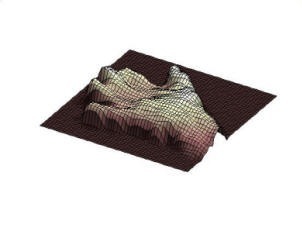 After the processing of nose removal, the disparity data are fitted to a surface using a spline curve fitting algorithm. A reconstructed hand surface is shown in figure 4. We are currently working on extracting important image features from the 3d range data of the hand surface to identify a specific handshape. 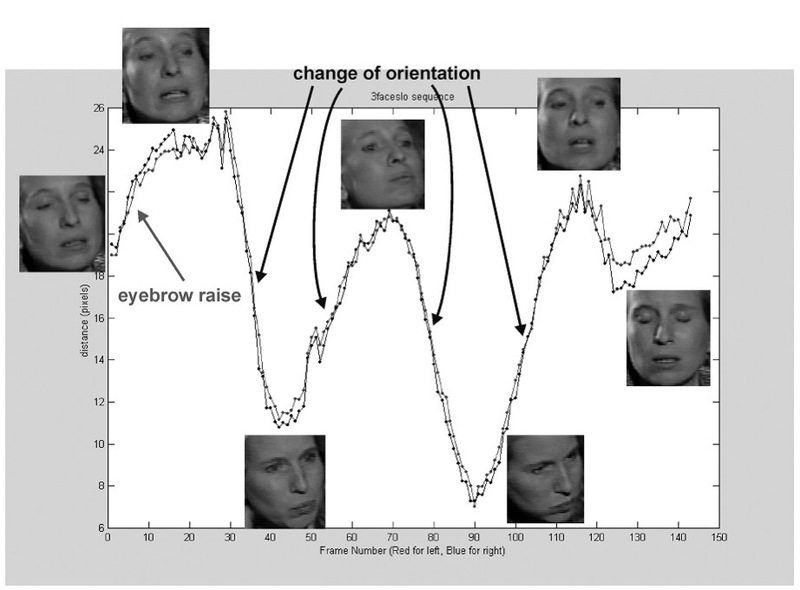 In the figure below, we show the plot of the eye-to-eyebrow distances versus the time (frame number) of the female signer sequence. 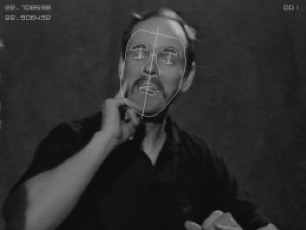 We also show some face actions (e.g. eyebrow raise, change of orientation) with respect to the measured values. In future work, we will develop an algorithm that can automatically recognize these face expressions.